What About Buk Chang Dong Soon Tofu When The Donger Need Food? 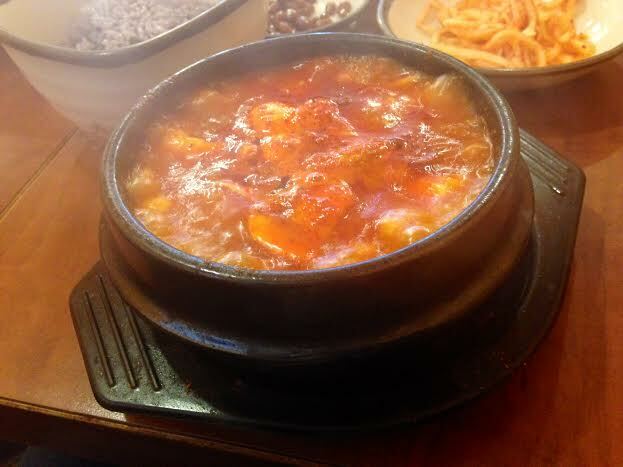 When one mentions Korean food in Toronto, Buk Chang Dong Soon Tofu is on the top of this list. Not to be mistaken with Long Duk Dong of Sixteen Candles fame, Buk Chang is a College Street mainstay. It is part of my quest to tackle Korean food this year and having a colleague craving bibimbap in a hot stone bow, it seemed a logical stop. Luckily, it was just past the lunch hour so we easily secured a table in the back corner and were handed the one page menu. The decor was rather plain but not uncomfortable. Boasting a menu of 9 items with only 2 of them over $7, I ordered the seafood soon tofu with the hot pot of rice for $8 while she ordered the bibimbap for a little under $10. One of the things I love about the Korean experience is the banchan, which is an array of side dishes which compliment the main dishes. 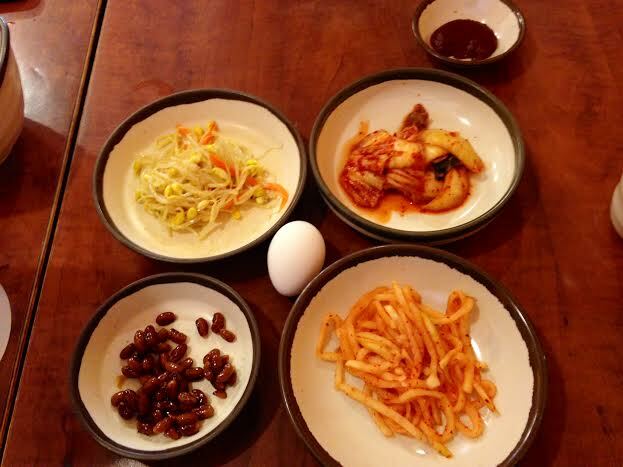 These are somewhat open to interpretation but usually include kimchi, steamed vegetables (called namul) and other things like pancakes which can contain any number of ingredients. In the case of Buk Chang, we were treated to some bean sprouts, kimchi, radish and some Kuromame black beans. The beans were the best part of the banchan and although the rest of the offerings were good, they were far from mind-blowing. I’m a little stubborn when I go out and eat in an environment that is somewhat foreign to me. There have been numerous instances where I have been faced with questions like “Should I eat this hot pepper or is it just garnish?” or “Which sauce goes with which dumpling?”. Today was no different. I cautiously spied patrons at other tables for hints on proper conduct although I’m not sure there is a particular science in eating Korean food. I mean, you don’t have to have a Michelin star to conclude that an shelled egg placed on the table should eventually end up cracked in my soup. What confused me a little more was the reason why the server poured water in my bowl of purple rice after he scraped most of it into another bowl. Was it to help out the dishwashers? To cool the bowl down in case I forget and burn myself? Was I supposed to do something with it to complete my meal? In the end, I never got the answer despite watching an older Korean lady who ordered the same thing as me. She didn’t give the rice bowl a second glance which did nothing to answer my question. The seafood soon tofu arrived bubbling. I dropped the egg in and watched the protein denature like I was presenting a grade 8 science project. The tofu itself was amazing; it’s texture hit that part of my brain that made me fall in love with things like rice pudding and tapioca. The broth was punchy but delicate. Understanding that this is a restaurant with a significant devotion to tofu, I still found the seafood contribution nothing short of measly. Two tiny unshelled, head-on shrimp and one mussel were absolutely lost in the big bowl of tofu. I’m not really a fan of rice but I enjoyed a few bites from the bowl of the purple grain that was served with the soup. 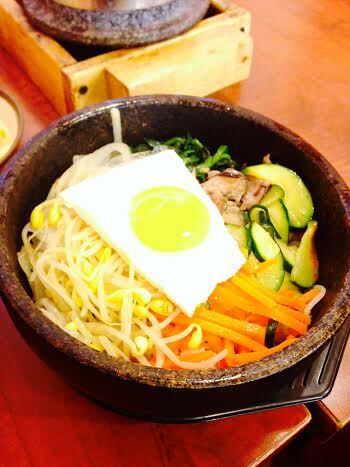 I’ll be the first to admit I’m not a huge fan of bibimbap mainly due to the fact that it’s mostly rice. That said, if you crisp up some rice against a hot stone bowl and add a fried egg among other things you can at least peak my interest. It was a decent $10 bowl of rice. The egg was nicely done and other condiments were used in good proportion. Most white people will confess that their experience with Korean food has been limited to bulgogi beef and bibimbap, a statement which is possibly as stereotypical as the gong which sounded every time Long Duk Dong entered a scene during Sixteen Candles more than thirty years ago. Buk Chang’s focus on soon (soft) tofu opens another page in the Korean cookbook. Other than the mystery of the water pitcher, this place offers a straight forward experience in a no frills fashion. That said, when I ponder the scant amount of seafood in the soup, I need to remember that in the end I’m getting a filling meal for about $8 although I think calling it seafood soon tofu is a tad deceiving. In many good lunches and dinners you only ultimately remember every perfect ration eaten, great nosh and nectarous thrill. Coming here and nibbling inferior kimchi and bland namul prevents me from calling this the best Korean experience I’ve ever had but based on the tofu soup and the bibimbap, I understand why it’s become a staple for many ethnic food enthusiasts in the GTA.